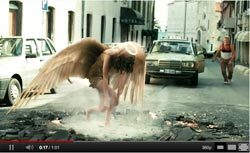 Ever wondered whether visual special effects (VFX) were only good for gussying up agency work? Such effects could be better at achieving certain campaign goals, according to new research from VFX provider GenArts. According to GenArts, high-quality VFX engage audiences, improve quality perception, and increase viewers’ likelihood to purchase. Specifically, VFX were shown to drive a 13% increase in downloading a coupon, a 9% lower abandonment rate, and an increase in purchase intent of up to 12%. As online video advertising expands, GenArts also believes that VFX will be necessary for brands to stand out. GenArts used videos featuring sports lifestyle company Puma to verify the impact that visual effects have on the overall effectiveness of video promotions. The resulting case study tested two versions of the same Puma sneaker promotion -- one treated with visual effects and one without. The effect-treated video outperformed the untreated constant and demonstrated significant increases in engagement metrics across the board. The effect-treated video registered a 9% to 12% increase in purchase intent; a 10% increase in brand preference; a 9% increase in brand credibility; a 9% increase in time spent watching the video; a 9% increase in likeliness to watch the video again; a 9% decrease in likeliness to stop watching the video before its end; and up to a 13% increase in likeliness to download a coupon. “We’ve found visual effects to be an effective way to make videos of all types perform better and to help cut through in a cluttered marketplace,” said Antonio Bertone, CMO of Puma. While still small compared to TV money, ad-supported online video is on fire. In October alone, Americans viewed 7.5 billion video ads, according to recent data from comScore Video Metrix.